TRANS-X MARKS THE SPOT! ISSUE #52 OF TARG ZINE IS HERE! Pascal Languirand adorns this month cover of TARG zine. His synth group TRANS-X is know for their massive worldwide hit "Living On Video" which charted worldwide & peaked at #61 on the Billboard Hot 100 in 1983. 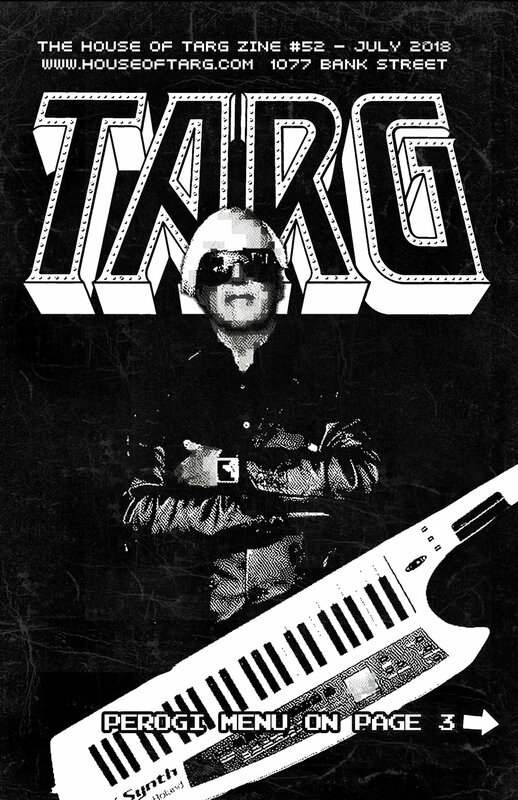 We are stoked to have TRANS-X at our Synthesizer Festival this July - Details inside this issue of TARG Zine. INSIDE THE JULY ISSUE: Did you know about our Family Free-Play Super Summer Sundays? Every Sunday from 11am - 8pm all of our Classic Arcade Cabinets will be on Free-Play - that Unlimited video game action until labour day!!!!! Heads up - there is a new item on our perogi menu - check it out! Get Psych Savvy with Ottawa’s expert - John Westhaver of BIRDMAN SOUND shares his list of essential psych wax to get you primed for the Ottawa Psych Fest. UNDERWATER DANGER - the Toys R Josh comic gets deep this month & has an accompanying video that you can watch online, Curtis has yet another side splitting edition of the Adventures of TARG comic, Open up the pages of TARG Zine to take Monty’s Master Class - this month he divulges everything you need to know to get some unbelievable score on the RIPLEY’S BELIEVE IT OR NOT Pinball Machine, Big Bernie gives you the straight good on our newest gun game POLICE TRAINER (1997) in his Arcade Super Guide. S.O.S.Fest returns to TARG this July with some incredible SynthPop, DarkWave, bands - we are proud that half the performers are women - checkout what makes these Diode Divas tick on an interview column call THE WOMEN OF S.O.S.FEST. Wizard Sheila has another cool interview in her “SISTERS IN THE CITY” Column - this month she talks tp Franco-Ontarian mixed Media/Graffiti/Mural artist Mique Michelle. Hey Let celebrate 45 years of KISS with the ultimate KISS tribute band KISSED…. even the dude from the hit kissed themed comedy Detroit Rock City will be at TARG, Always something cool going on across the street at THE MAYFAIR - this month they have a Quentin Tarantino Film Fest Going Down, SLO’ TOM handles some serious career advice from WaterWorld star Kevin Costner, Gap year Felix reviews the new BOOJI BOYS tape, Jennilee has a fun illustration for you to colour, Photographer Andrew Carver captured experimental electronic circuit bending duo RASS for this months TARG pin-up and last but not least everything you need to know about all the full events happening at TARG this month can be found in YOGI’s Perogram - Grab your free copy at the arcade of DOWNLOAD IT HERE.